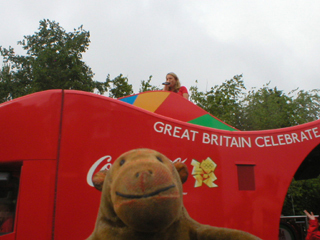 It had come to Mr Monkey's notice that there was some sort of Olympic Games sort of thing happening in London, and that there was going to be an Olympic Torch Relay all over the country. 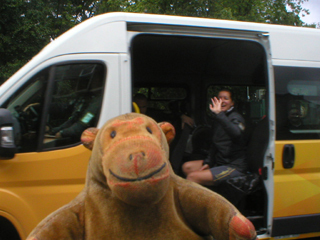 Then he found that on June 24th, day 37 of the relay, the Olympic torch was going to be carried 121.35 miles by 151 people, and that one Torchbearer was almost going past Mr Monkey's house. It seemed only polite to go out and see it go by. 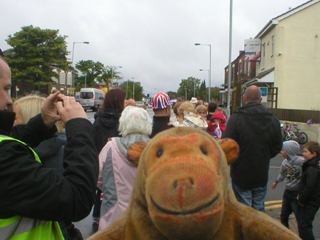 Horribly early on Sunday morning Mr Monkey made his humans go to the end of their street and join the crowd waiting for something to happen. He'd never seen so many people outdoors in Great Moor so early on a Sunday morning, but he'd seldom been outdoors so early on a Sunday himself. After he'd been waiting for 20 minutes or so, some police motorcycles and a van with a sign saying the Torch was six minutes away went past. A couple of minutes later, large trucks representing the Olympic Presenting Partners rolled past. All three were staffed by absurdly cheerful people. There was a short gap, then a pair of support vehicles of some sort went past. Mr Monkey wasn't sure what they were actually doing, but one had a lady waving nicely from an open door, and the other looked rather like a converted horse-box. Mr Monkey had no idea what these vehicles did, but thinks they must have been there for a purpose, such as carrying Torchbearers when they weren't running. Just after the support truck went past, everyone who was holding a flag or an imitation torch started waving it and anyone who wasn't holding a camera started cheering. 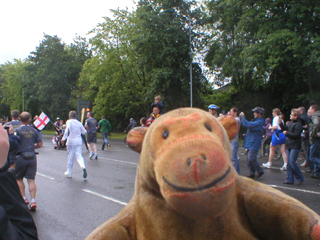 For a moment Mr Monkey could see a real flame brandished above the heads of the crowd, then he saw the official Torchbearer run past him. Luckily the Torchbearer wasn't running so fast that the torch blew out, and he wasn't messing around on his phone either. 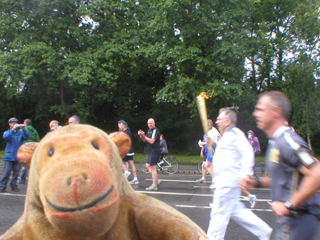 Just running and bearing a torch, which is pretty much what Mr Monkey expected of a Torchbearer. 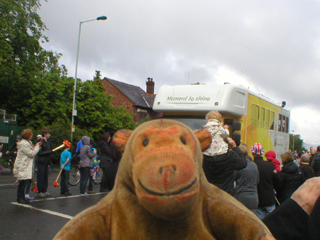 Mr Monkey wasn't told which of the 12 Torchbearers taking the torch through Stockport he had seen, which was a bit annoying. When the torch had gone up the road a bit, a police car turned up and strongly suggested that anyone standing in the road get back onto the pavement, as a lot of traffic wanted to use the A6 for non-Olympic activities. Some people went off to the Adidas building where the torch was stopping prior to being relayed to Denton and there was supposed to be entertainment of some kind. Mr Monkey considered going too, but remembered he hadn't had any breakfast. So he went home to The House of the Orange Monkey.